Cherry Tree Quilts in Summerland, BC is a quilting teaching centre. machine quilting, and Longarm Quilting. Interested in quilting but don't know how? Sign up for our "Beginner Sampler Class" and make your first quilt. Take our Intermediate Sampler Class and make this beautiful "Spotted More Paper" Quilt by Zen Chic. Join Barb & Rusty on the third Wednesday of the month for our Kimberbell Machine Embroidery Club. No need to pack your machine, but you can if you wish! We'll keep it simple with a short presentation and demo. You will receive a USB Key and each month it will be loaded with the Dealer Exclusive Kimberbell Designs embroidery files specific to your machine. Plus, get the Embroidery Block of the Month files too! 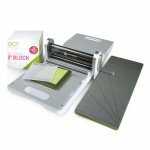 Join Dianna as she explores the possibilities and techniques using the Accuquilt Cutting system. Cost - $10 per month. Each month, participants will receive a $10 coupon for use in-store on any Accuquilt product. Okanagan Modern Quilt Guild - Summerland Arts Council Building. Focusing on Modern designs, Fun and Sharing, meeting on the second Wednesday monthly. Sew-ins, Instructors to be added as the guild grows. Open to any Quilter, Beginner to Professional, Modern or Wanna-be or just interested in the Modern movement. Really anyone who loves to quilt. Cherry Tree Quilts will stay open late until 7pm on Guild Meeting nights. A new two-day event with a sewing and garden theme! This event features Kimberbell boutique Blanks: polka dot tea towel, buffalo check tote, and rectangle pillow form, plus darling scissors and tape measure. Learn new techniques like over-the-edge applique and more. It's a cheery celebration, sewing with friends, and Kimberbell!